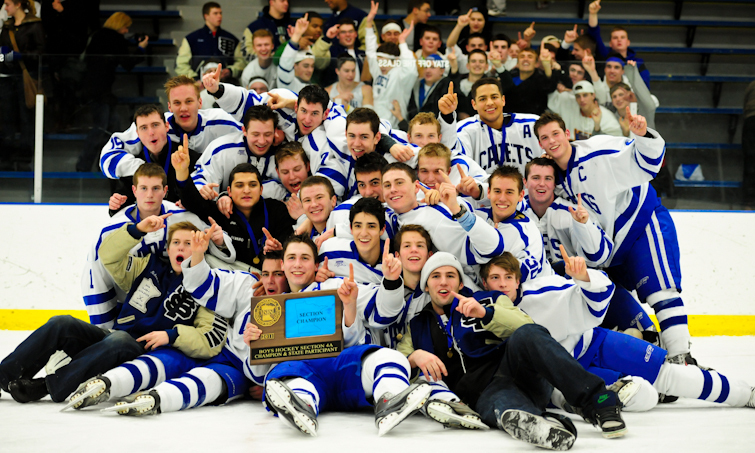 It must have seemed like an eternity for St. Thomas Academy since the last time the Cadets played in the State Tournament. The wait ended on Friday, March 4, as St. Thomas Academy defeated Totino-Grace 5-3 in the Section 4A championship game. 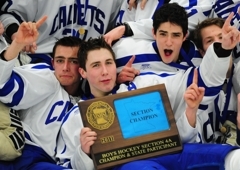 After winning the Class 1A title in 2008, the Cadets had failed to return to the tournament after being upset by Mahtomedi in the 2009 and 2010 Section 4A championship games. 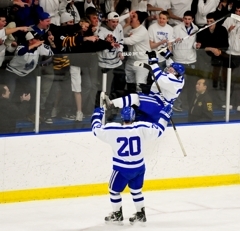 St. Thomas Academy spent those disappointing years watching the tournament from the stands which increased their aspirations to return to the Xcel Energy Center. 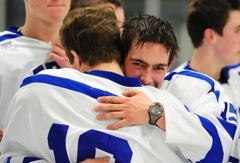 Leading the Cadets to the 2011 Section 4A title were senior forwards A.J. 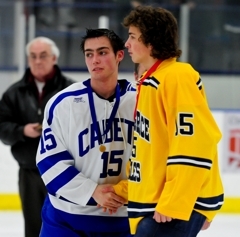 Reid and Zach Schroeder. 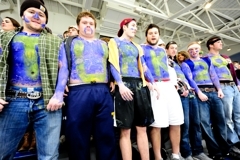 “This is really special for the seniors because we’ve lost two section finals,” Vannelli said. Exhilaration had already settled in for the upperclassmen. 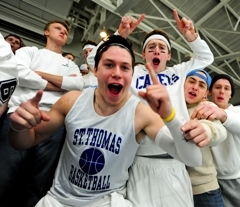 St. Thomas Academy is heavily expected to be selected as the tournament’s top seed in Class 1A. Regardless of the seeding, the Cadets have a simple game plan. “Don’t change anything,” Vannelli said. “We’ve had a good year and hopefully we can continue. 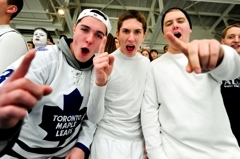 When the puck dropped Friday at the Class 1A, Section 4A final between No. 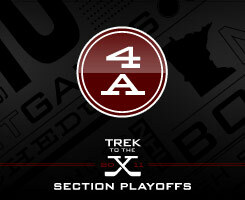 1 seed St. Thomas Academy and No. 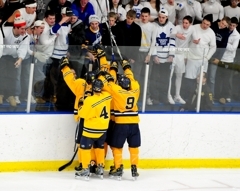 2 seed Totino-Grace, the Cadets student section immediately began chanting “This one’s over,” displaying substantial hubris — or confidence, depending on your perspective — for a school that has been upset two years in a row in the section final. 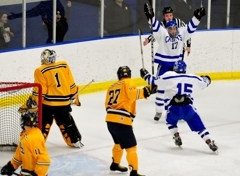 Whatever you want to call it, it’s immaterial now, as the Cadets earned their first state tournament bid since their championship run in 2008 with a 5-3 victory at Aldrich Arena in Maplewood. 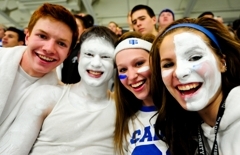 The Cadets struck first 4 minutes, 49 seconds into the first period, when senior forward A.J. 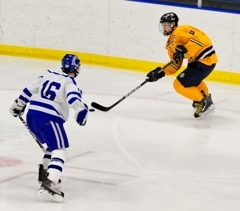 Reid flicked the puck past Totino-Grace goalie Nick DeMuth from just outside the crease. The score was tied 2-2 when St. Thomas senior Zach Schroeder scored the first of the game’s four third-period goals — all of which came with under seven minutes remaining — with 6:37 left. Less than a minute later, on a two-on-zero opportunity, sophomore Alex Johnson scored on an assist from Schroeder to make it 4-2. The Eagles struck back for one more goal, but so did Schroeder, icing the game. Andrew Baker is a University of Minnesota student on assignment with the Star Tribune. 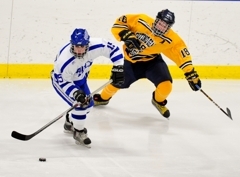 Totino-Grace traveled to play St. Thomas Academy on Feb. 1, this season. 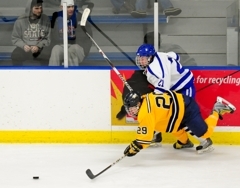 That night, St. Thomas Academy prevailed 6-0 as the Eagles could not figure out a way to beat Cadets’ sophomore forward David Zevnik. 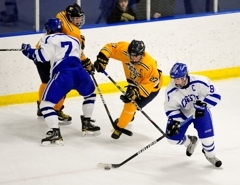 In the Section 4A championship game on Friday, March 4, Totino-Grace found a solution as the Eagles scored the only three goals against St. Thomas Academy in this year’s postseason. 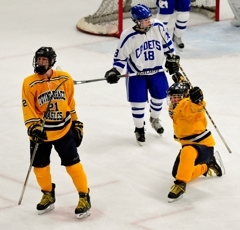 “I thought our kids played really, really well,” Totino-Grace coach Mark Loahr said. “We just couldn’t get the bounces tonight. They’re good enough that if you give them the chance, they put them away. 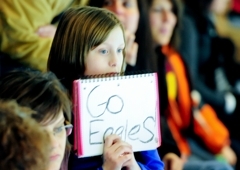 The Eagles headed into the third period tied 2-2 with the section’s top seed before surrendering three St. Thomas Academy goals in 4:55 -- Totino-Grace also scored in that time. 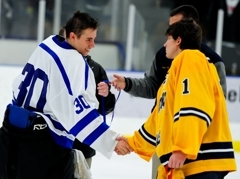 As far as the Eagles’ opponent, Loahr predicted success for the Cadets in the state tournament. A.J. 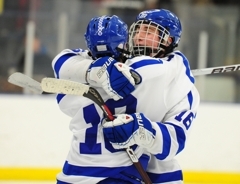 Reid scored twice and Zach Schroeder had a goal and an assist as St. Thomas Academy won the Section 4A Championship on Friday, March 4, with a 5-3 victory over Totino-Grace. 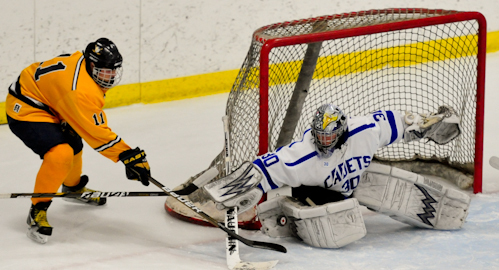 Alex Johnson and Andrew Commers also scored for St. Thomas Academy and sophomore goaltender David Zevnik made 23 saves as the Cadets improve to 22-6-0 on the season. St. Thomas Academy advanced to its first state tournament appearance since winning the Class 1A title in 2008. 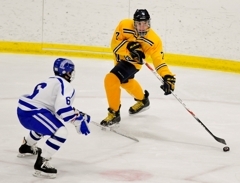 Nick DeMuth made 29 saves for Totino-Grace and Eagles' forwards Derek Lodermeier, T.J. Roo and Andrew McDonald scored goals the first goals in the 2011 postseason against St. Thomas Academy. 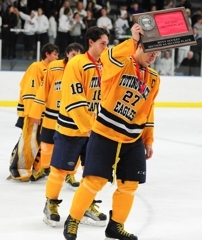 Totino-Grace finishes the season with a record of 21-6-1. 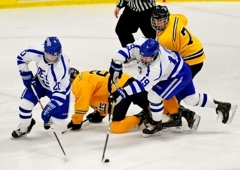 Next up for St. Thomas Academy depends on its seeding in the Class 1A State Tournament bracket but the Cadets are heavily expected to receive the No. 1 seed. 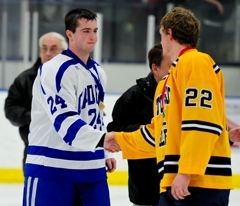 Reid scored the first two goals for the Cadets in the Section 4A championship game. 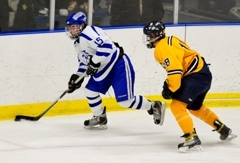 The two goals gave the senior forward eight postseason points (five goals, three assists) in three games. 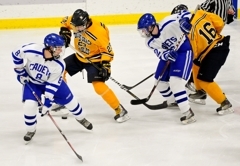 It seemed like whenever the Cadets were pressing in the Totino-Grace zone and gaining momentum, Schroeder was on the ice. The senior forward scored a pretty goal by walking a defender and putting a quick deke on Eagles' goaltender Nick DeMuth. Schroeder also assisted on Andrew Commers' third-period goal. 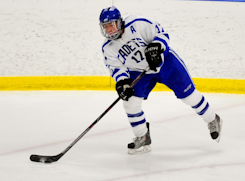 Although DeMuth surrendered five goals to the Cadets, three of those goals were scored on odd man rushes -- all two-on-one or two-on-none chances in the third period. 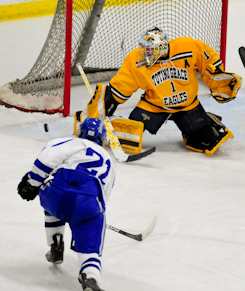 The senior goaltender made 29 saves including several flurries of shots from the slot by St. Thomas Academy and kept the Eagles in the game until the third period.